INTRODUCTION: Laparoscopic SG (LSG) is gaining popularity as a definite, isolated bariatric procedure for morbid obesity due to satisfactory weight loss and resolution of co-morbidities. 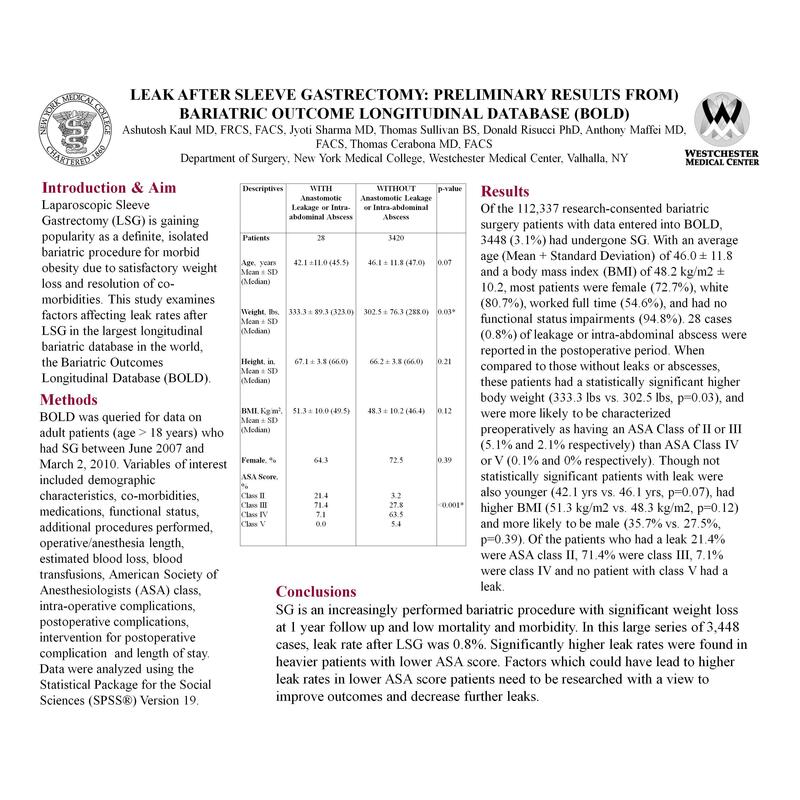 This study examines factors affecting leak rates after LSG in the largest longitudinal bariatric database in the world, the Bariatric Outcomes Longitudinal Database (BOLD). METHODS: BOLD was queried for data on adult patients (age > 18 years) who had SG between June 2007 and March 2, 2010. Variables of interest included demographic characteristics, co-morbidities, medications, functional status, additional procedures performed, operative/anesthesia length, estimated blood loss, blood transfusions, American Society of Anesthesiologists (ASA) class, intra-operative complications, postoperative complications, intervention for postoperative complication and length of stay. Data were analyzed using the Statistical Package for the Social Sciences (SPSS®) Version 19. RESULTS: Of the 112,337 research-consented bariatric surgery patients with data entered into BOLD, 3448 (3.1%) had undergone SG. With an average age (Mean + Standard Deviation) of 46.0 ± 11.8 and a body mass index (BMI) of 48.2 kg/m2 ± 10.2, most patients were female (72.7%), white (80.7%), worked full time (54.6%), and had no functional status impairments (94.8%). 28 cases (0.8%) of leakage or intra-abdominal abscess were reported in the postoperative period. When compared to those without leaks or abscesses, these patients had a statistically significant higher body weight (333.3 lbs vs. 302.5 lbs, p=0.03), and were more likely to be characterized preoperatively as having an ASA Class of II or III (5.1% and 2.1% respectively) than ASA Class IV or V (0.1% and 0% respectively). Though not statistically significant patients with leak were also younger (42.1 yrs vs. 46.1 yrs, p=0.07), had higher BMI (51.3 kg/m2 vs. 48.3 kg/m2, p=0.12) and more likely to be male (35.7% vs. 27.5%, p=0.39). Of the patients who had a leak 21.4% were ASA class II, 71.4% were class III, 7.1% were class IV and no patient with class V had a leak. CONCLUSION: SG is an increasingly performed bariatric procedure with significant weight loss at 1 year follow up and low mortality and morbidity. In this large series of 3,448 cases, leak rate after LSG was 0.8%. Significantly higher leak rates were found in heavier patients with lower ASA score. Factors which could have lead to higher leak rates in lower ASA score patients will be discussed in the presentation with a view to improve outcomes and decrease further leaks.